The last few days have been relatively mild for January with a small weather event on the 24th bringing some fresh snow but not too much accumulation. Locally, I stumbled across a few decent birds whilst jogging or doing other incidental activities. 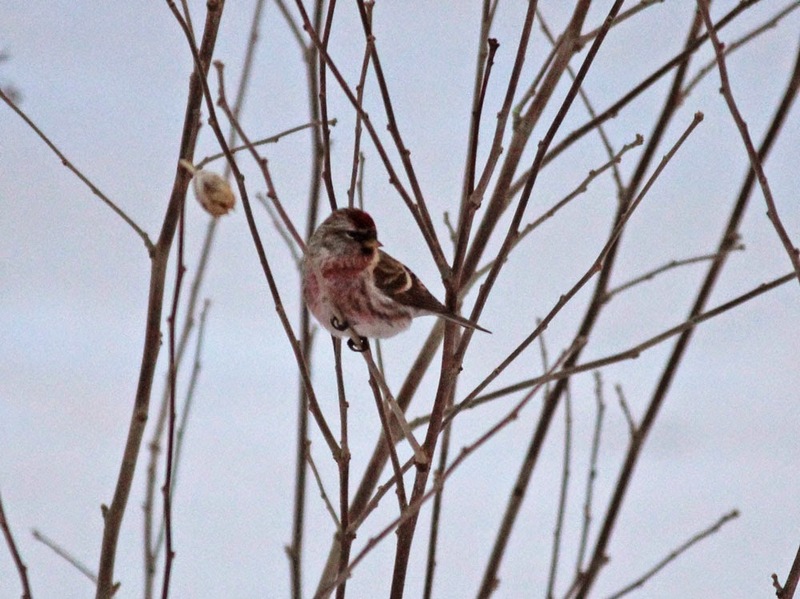 Jan 23rd saw two Common Redpolls joining the American Goldfinches and Pine Siskins on the feeders at home in Northfield. They appeared before sun up and had gone by the time the sun came up over the hills. 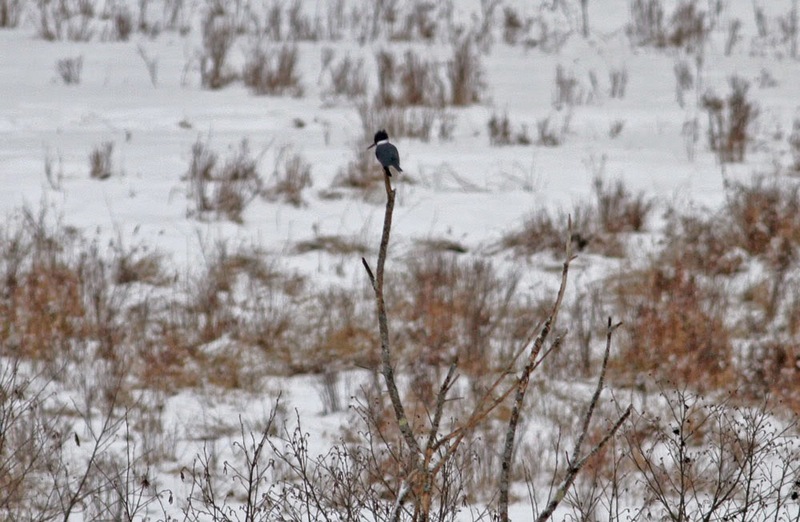 On the 24th, I heard a Yellow-bellied Sapsucker in North Cemetery, Gill just off Main Road and a surprise Belted Kingfisher behaving more like a Northern Shrike, teed up above a snow covered meadow off Main Road, Gill. Still in Gill, I again saw a Hermit Thrush on North Cross Road and a spectacular Barred Owl hunting close to the intersection with Boyle and Main Roads, both birds on the 25th. 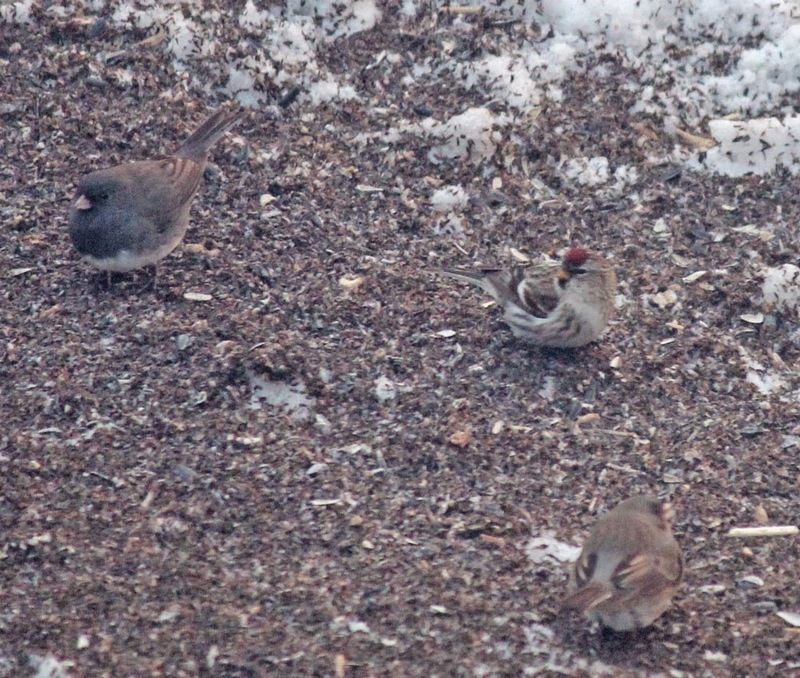 Common Redpolls - Northfield yard, Franklin Co., MA. January 23rd, 2015. Belted Kingfisher - Main Road, Gill, Franklin Co., MA. January 24th, 2015. On Saturday afternoon, Brian Kane and I got together at the power canal and went through some gulls before eventually getting 'weathered-out' by an encroaching snow storm. However, the male Barrow's Goldeneye arrived nice and early among the first flocks of the 400 or so Common Goleneye that had arrived by 5pm. Goldeneyes were still coming in when we left. 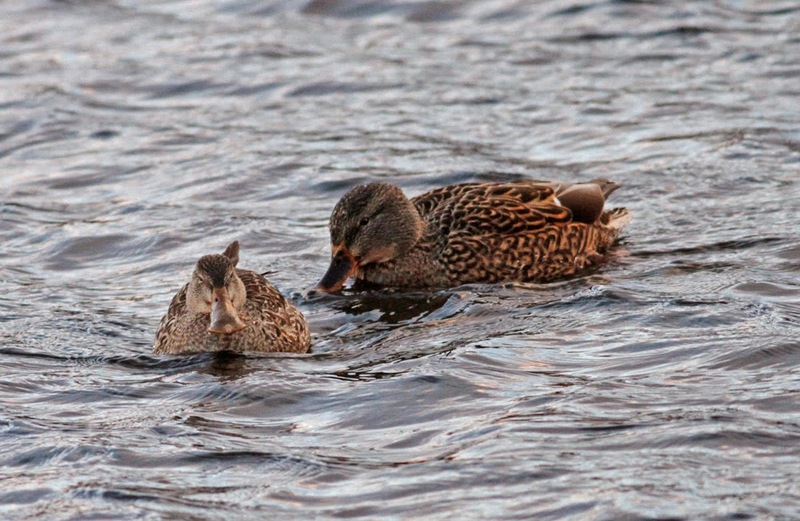 It's really been an amazing diving duck spectacle at the power canal so far this winter. 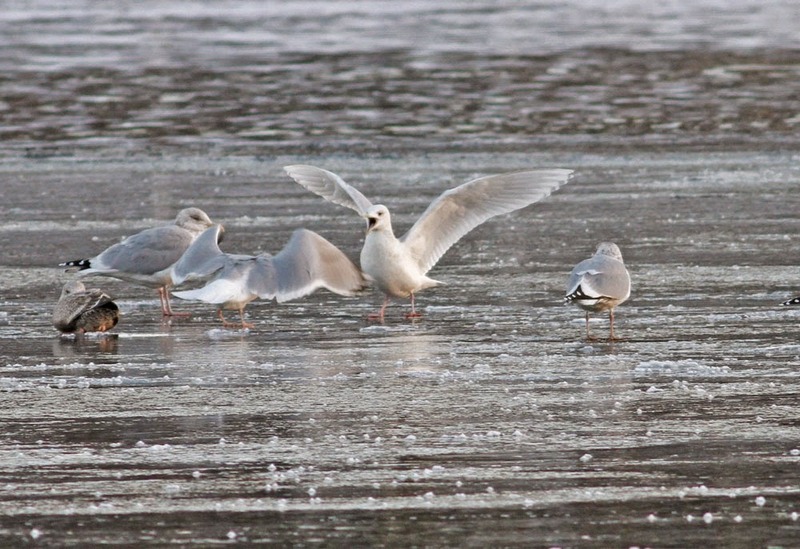 Kumlien's (Iceland) Gull (right) - first-cycle, Turner's Falls power canal, Franklin Co., MA. January 24th, 2015. 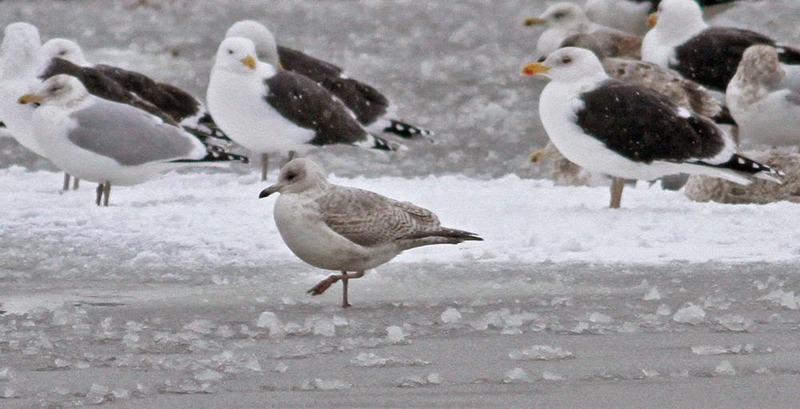 Kumlien's (Iceland) Gull - second-cycle, Turner's Falls power canal, Franklin Co., MA. January 24th, 2015. 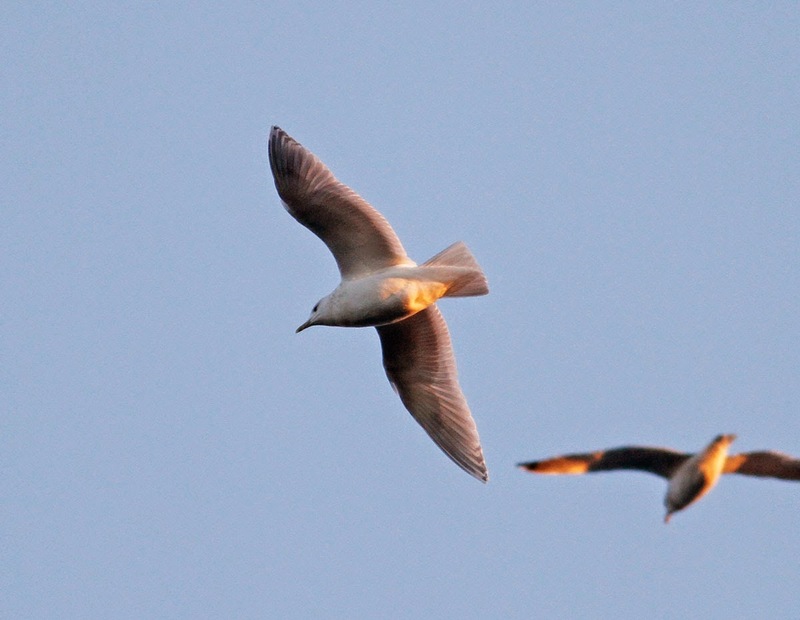 Kumlien's (Iceland) Gull - first-cycle & second-cycle together, Turner's Falls power canal, Franklin Co., MA. 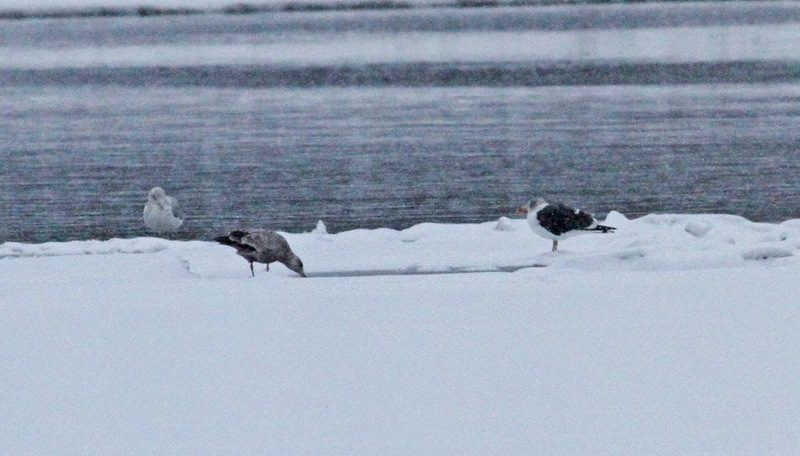 Lesser Black-backed Gull (right) - adult, Turner's Falls power canal, Franklin Co., MA. January 24th, 2015. 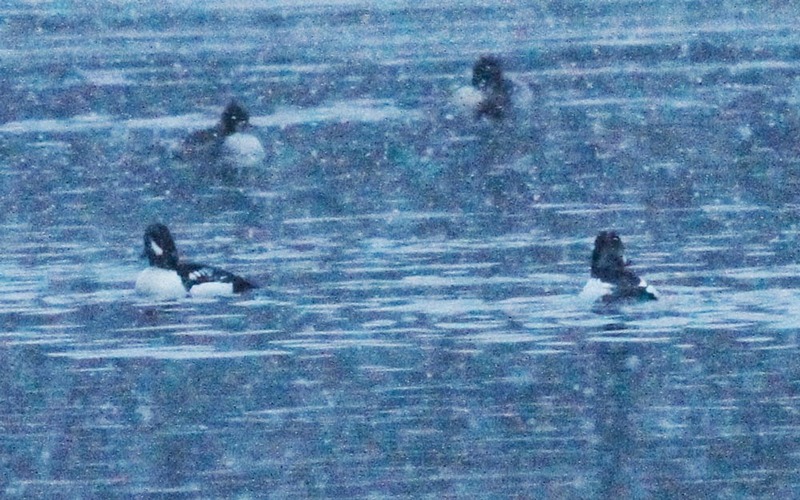 Barrow's Goldeneye (left) - male in snowstorm, Turner's Falls power canal, Franklin Co., MA. January 24th, 2015. 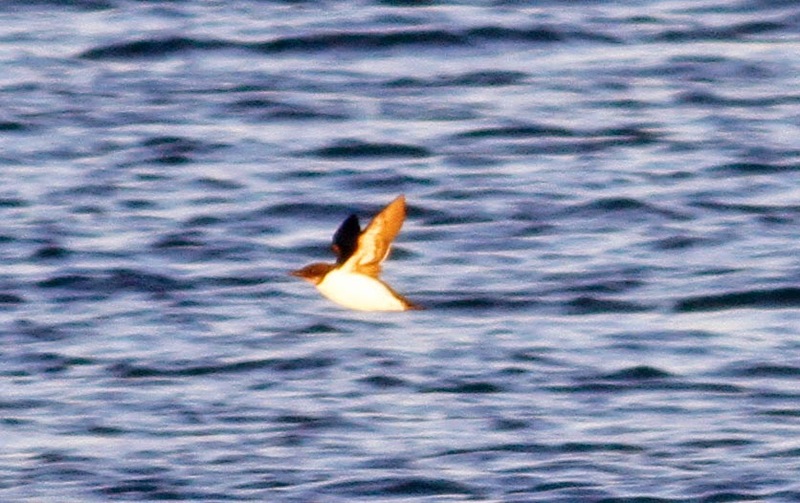 Thick-billed Murre - Parker River NWR, Essex Co., MA. January 23rd, 2015. Nice close fly past at low tide. 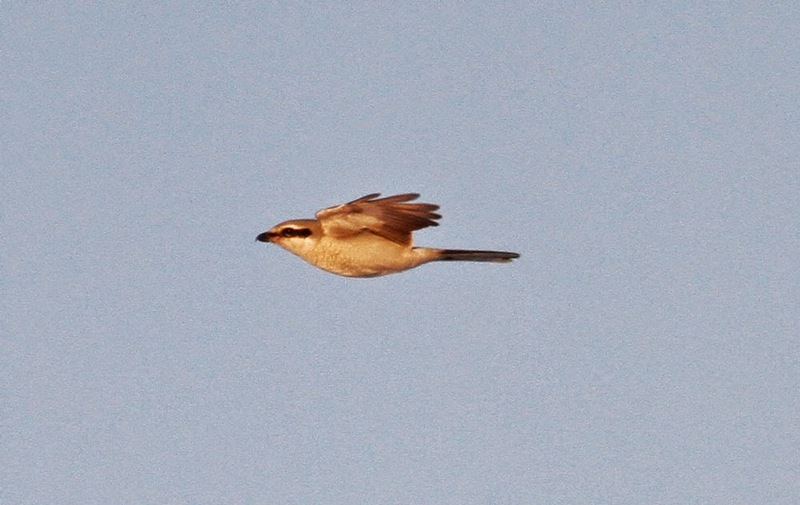 Snapped a few record shots from the top of the dune boardwalk at Lot 6. Had a fairly low key evening visiting to Turner's Falls with Matan. Bald Eagles were pushing the gulls around quite a bit and I ended up settling for Unity Park where a nice Merlin was teed up for a while on the Gill side of the river and a first-cycle Kumlien's Gull showed up quite late but with enough light to make it easily identifiable. 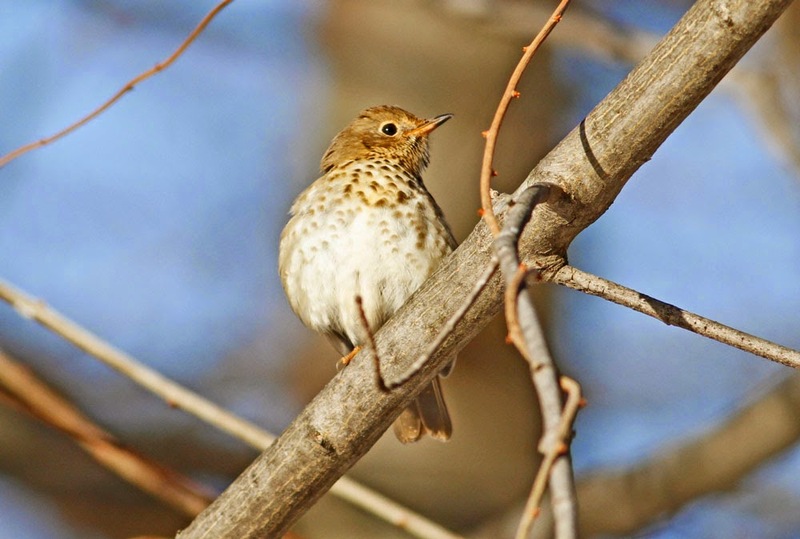 At home in Northfield, the Hermit Thrush continues, along with slightly better numbers of Pine Siskins (5) and American Tree Sparrows (10). Merlin - Riverview Drive, Gill but seen from Unity Park, Turner's Falls, Franklin Co., MA. January 22nd, 2015. 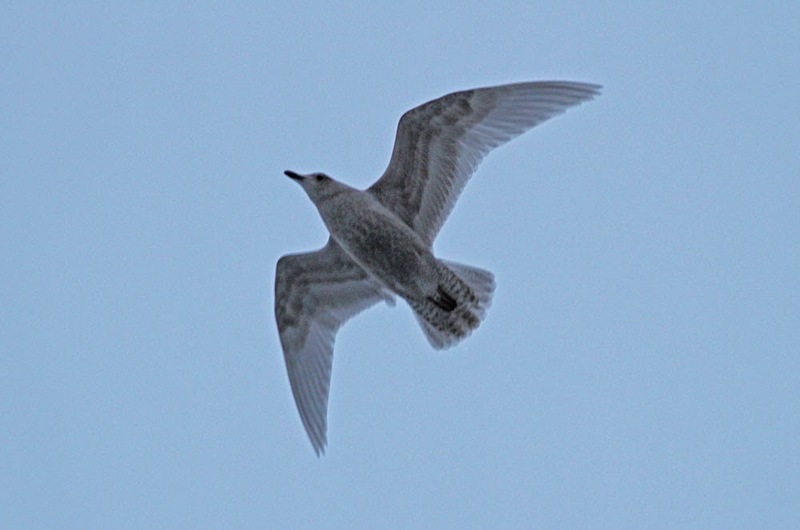 Kumlien's Iceland Gull - first-cycle. Unity Park, Turner's Falls, Franklin Co., MA. January 22nd, 2015. This morning I briefly stopped by the power canal to get some shots of the Mallards and Black Ducks lurking under the northern bank. The ducks tend to hang out near the powerline cut but it wasn't long before my attention was drawn to things other than waterbirds when a party of three Common Redpolls flew over calling. The shrubbery underneath the powerline was busy with Black-capped Chickadees, White-breasted Nutchatch, Tufted Titmouse, American Tree Sparrow, and some very smart Eastern Bluebirds. Above all, woodpecker activity was exceedingly busy with lots of drumming and a remarkable gliding display flight from a pair of Downy Woodpeckers, something which I've only seen on a handful of occasions. It was pretty close to a woodpecker bonanza with Hairy, Downy, Red-bellied and Pileated all on view simultaneously. It could hardly get better.....but it did as a couple of Hermit Thrushes and Golden-crowned Kinglets also popped into view. 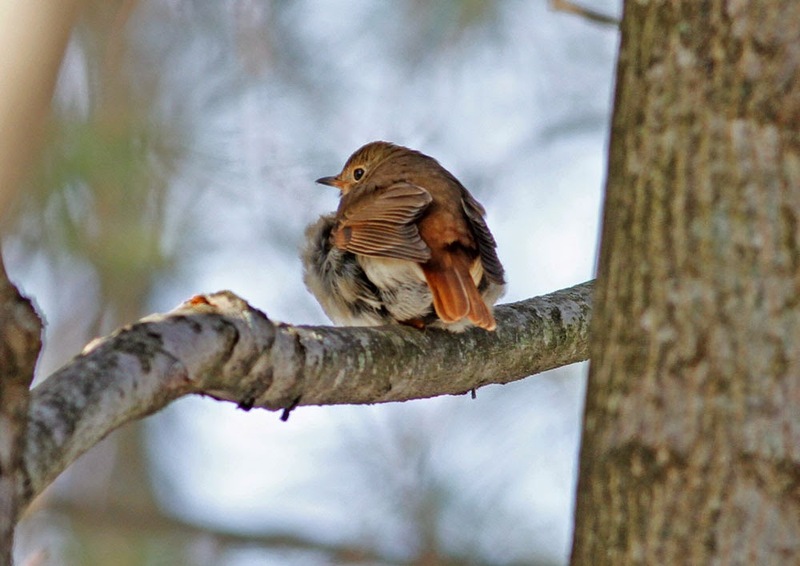 I might also have heard a Winter Wren but decided to let that one go. Nice birds, nice morning, great place! 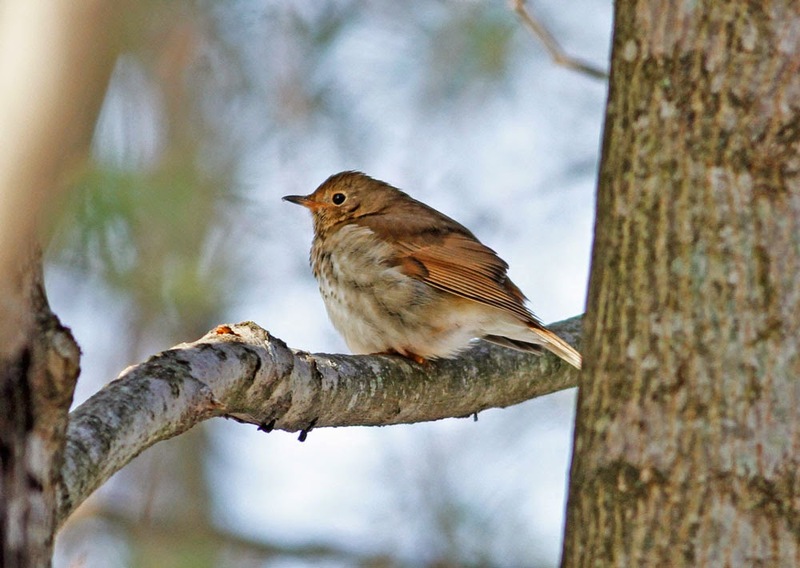 Hermit Thrush - Turners' Falls power canal, Franklin Co., MA. January 21st, 2014. Two present giving 'chut' calls back and forth. 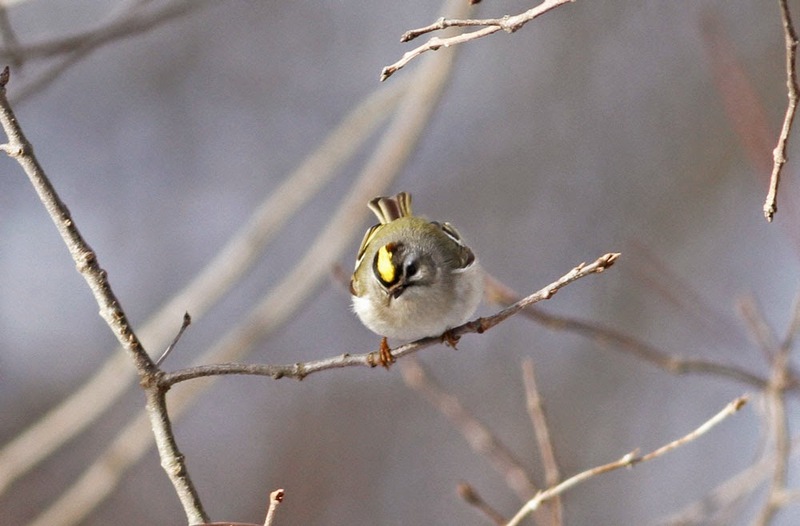 Golden-crowned Kinglets - Turners' Falls power canal, Franklin Co., MA. January 21st, 2014. 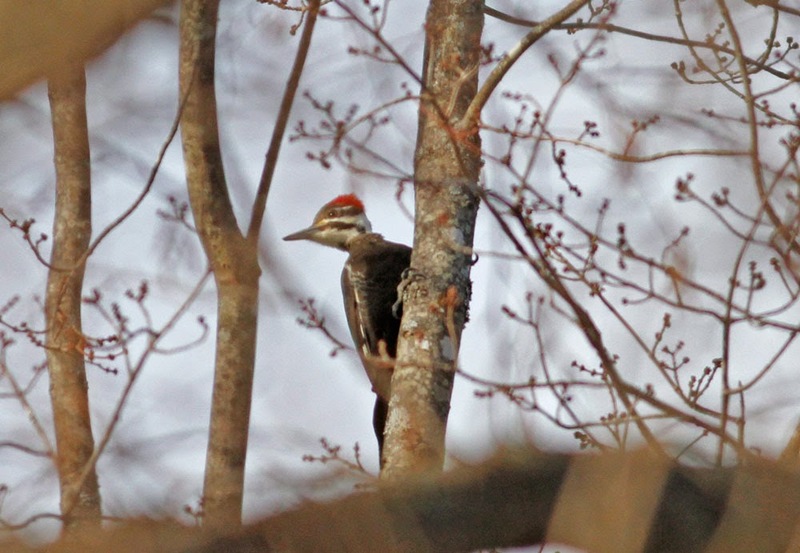 Pileated Woodpecker - Turners' Falls power canal, Franklin Co., MA. January 21st, 2014. Currently almost daily in the power canal surroundings but usually heard, and not seen. Today's freezing rain curtailed any thoughts of late afternoon birding at Turner's Falls. Before the rain really started in earnest, I went out in mid-morning hoping to find a few Horned Larks in Northfield. 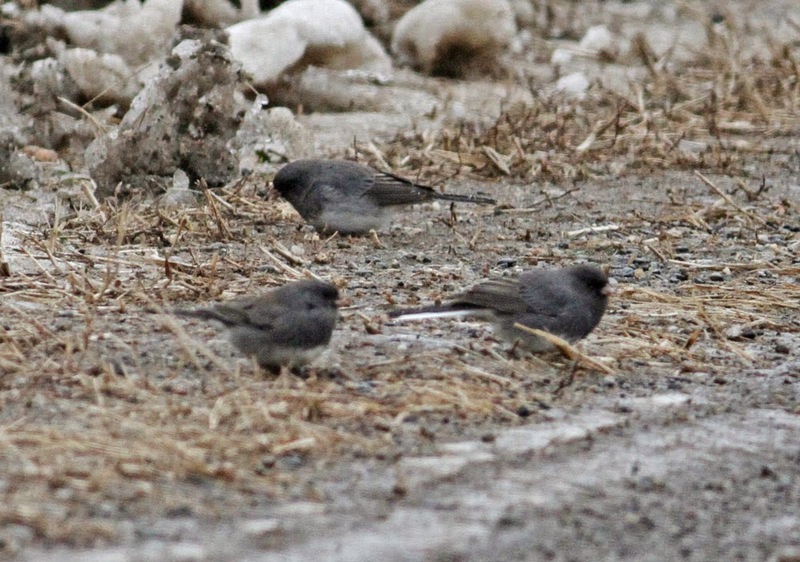 I found no larks in the spot that I was hoping for but instead found three Dark-eyed Juncos, one of which had a distinct (convex) hooded appearance with a relatively clean demarcation between the 'bib' and flanks. The flanks of this bird were also much paler than the other two male Slate-coloreds that it was feeding with. It looked much as I'd expect a Cassiar Junco ((Junco hyemalis cismontanus) to look like and the first time I've seen a male in Massachusetts. Cassiar Junco is a much discussed intergrade form (between Slate-colored and Oregon Juncos) originating from the northern Rockies. 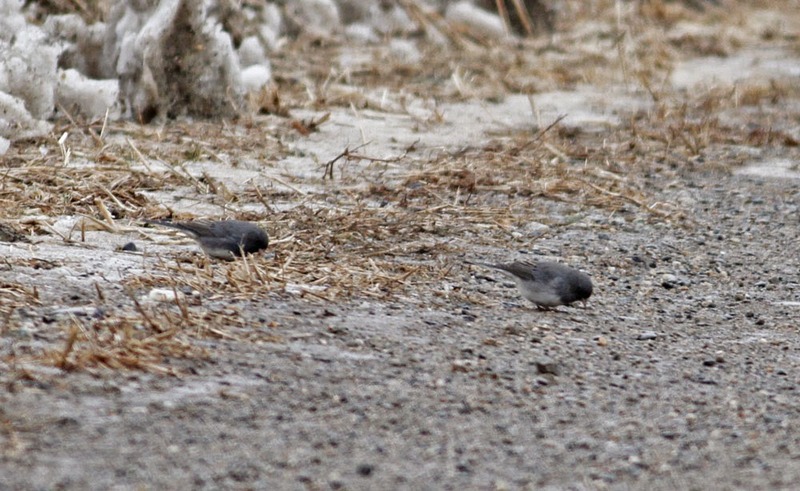 Cassiar Junco (right) - male with typical Slate-colored Junco, Caldwell Road, Northfield, Franklin Co., MA. January 18th, 2014. 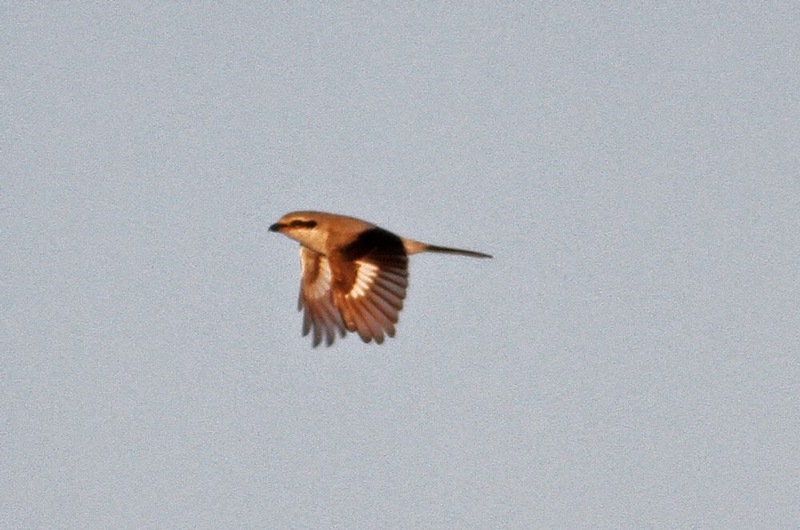 Distinctly hooded appearance but otherwise paler especially on the flanks. 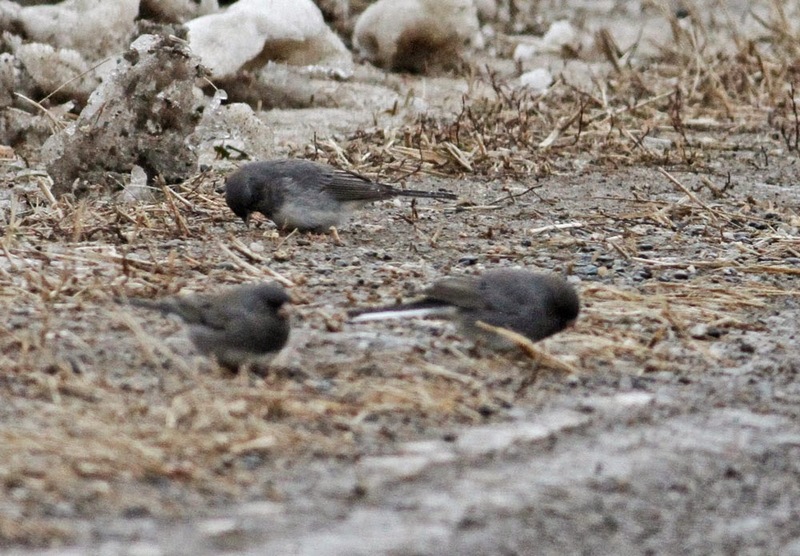 Cassiar Junco (rear) - male with typical Slate-colored Juncos, Caldwell Road, Northfield, Franklin Co., MA. January 18th, 2014. 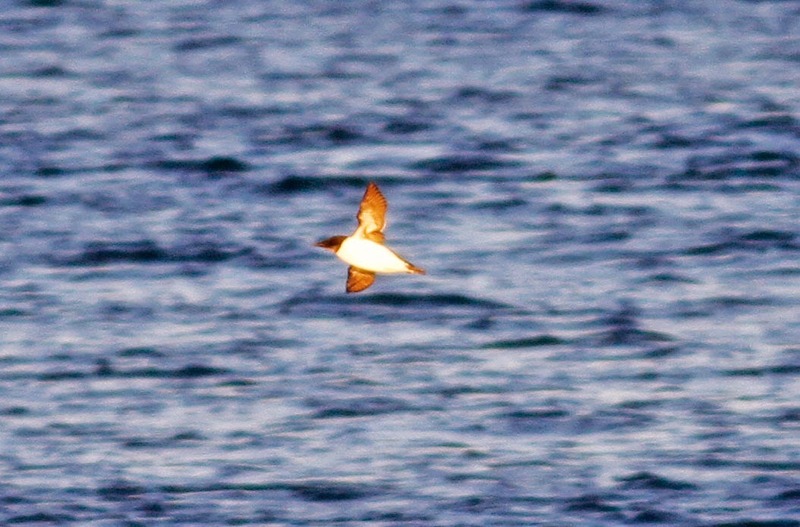 Distinctly hooded appearance but again much paler especially on the flanks. Saturday evening saw a few of us gather at the Turner's Falls power canal in frigid condition. Cold it may have been but it was well worth it as a spectacular roost of Common Goldeneyes eventually built up to over 380 birds! That's the most I've ever seen in one gathering anywhere in the Pioneer Valley and what's more, birds were still coming in when we left well after sunset. 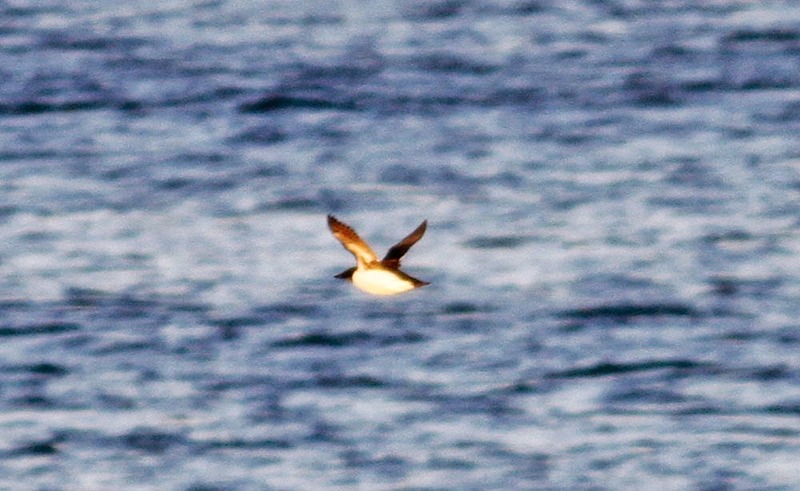 The spectacle almost overshadowed the continued appearance of the fine male Barrow's Goldeneye. The gull show was cut short by Bald Eagle activity once more, but the Lesser Black-backed Gull showed well and seems to be pretty reliable at the moment. 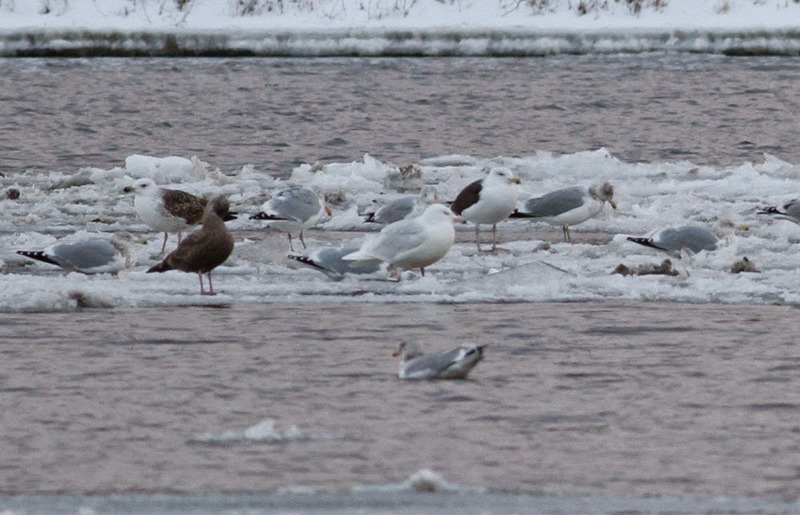 Lesser Black-backed Gull - adult, Turner's Falls power canal, Franklin Co. MA. January 17th, 2014. 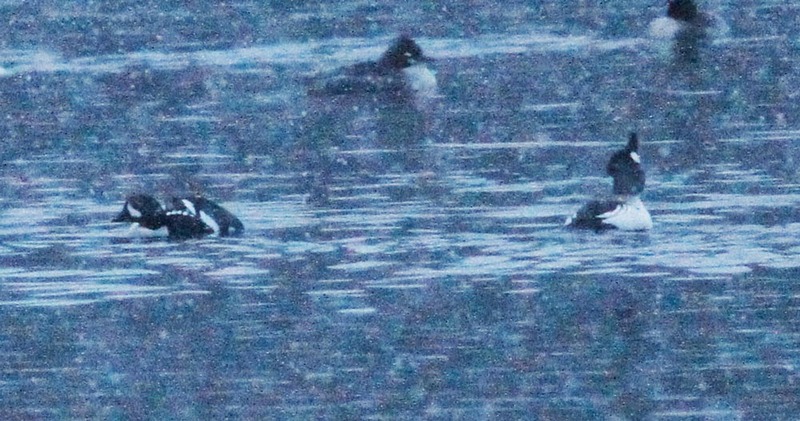 Barrow's Goldeneye (center) - adult male, Turner's Falls power canal, Franklin Co. MA. January 17th, 2014. A few nice birds around today. Despite the frigid start (0 deg F), two Hermit Thrushes and a Northern Flicker were along North Cross Road in Gill. In the afternoon, what should have been a quick check of the power canal became a more extended visit as a small group of birders gathered and watched flights of gulls and ducks arrive to roost. 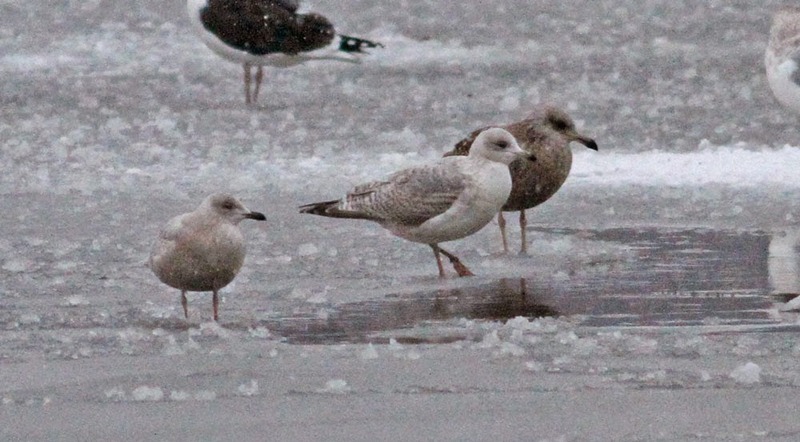 A beautiful adult Kumlien's Iceland Gull, as well as the contiuning adult Lesser Black-backed Gull, came into join the gulls which numbered over 300 by the end of the evening. The Goldeneye roost is getting really impressive and over 200 birds came in to roost this evening. Sadly for the assembled birders, the male Barrow's came in quite late and was quite difficult to pick out in the fading light. But it was great to see it (or another?) back on the power canal, and I think this bird has been recorded daily since Josh Rose pinned it down on January 12th. 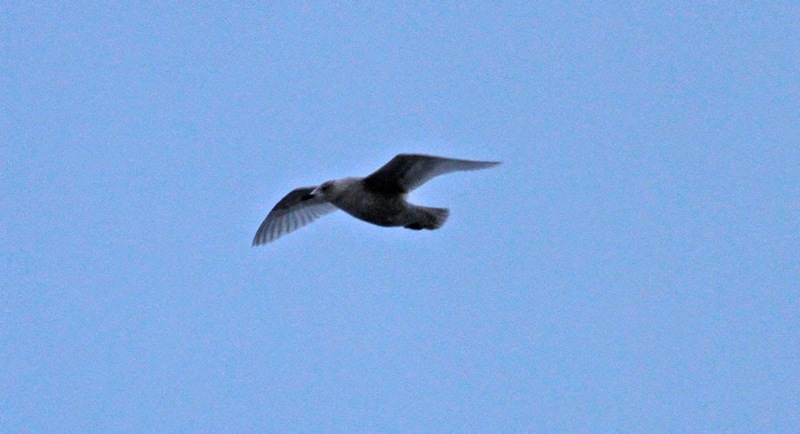 Kumlien's Iceland Gull - adult, Turner's Falls power canal, Franklin Co., MA. January 15th, 2015. Barrow's Goldeneye (center) - adult male, Turner's Falls power canal, Franklin Co., MA. January 15th, 2015. 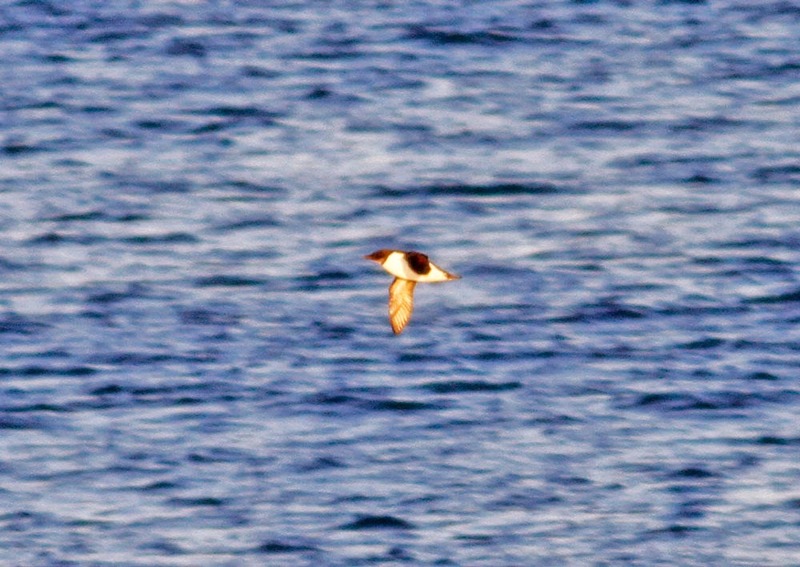 The image doesn't really reflect on how dark it was when this bird came in. 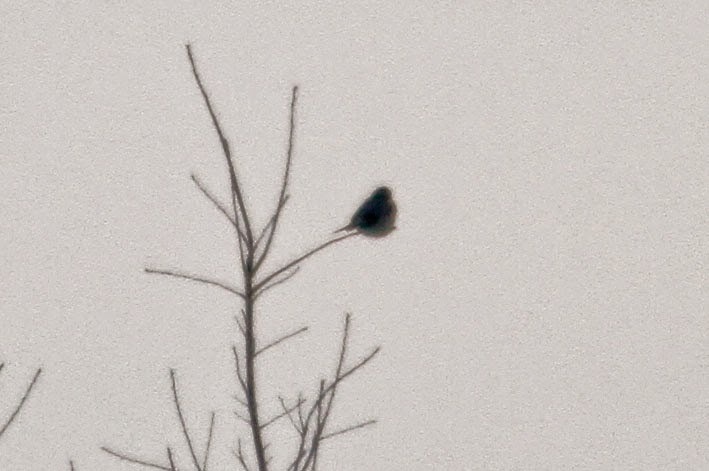 A desperate record shot but the essential field marks can still be seen. Yesterday afternoon I called in at Arcadia Meadows Wildlife Sanctuary hopeful of catching up with a dark-morph Rough-legged Hawk seen there over the weekend. It was late in the day when I arrived and I didn't have any luck with the hawk, but I did find this smart Northern Shrike. It was actively harrassing Horned Larks and Snow Buntings though I didn't actually see it catch anything whilst I was there. It seems to be a decent winter for these denizens of the north and I'm pretty happy that I'm bumping into them so frequently. 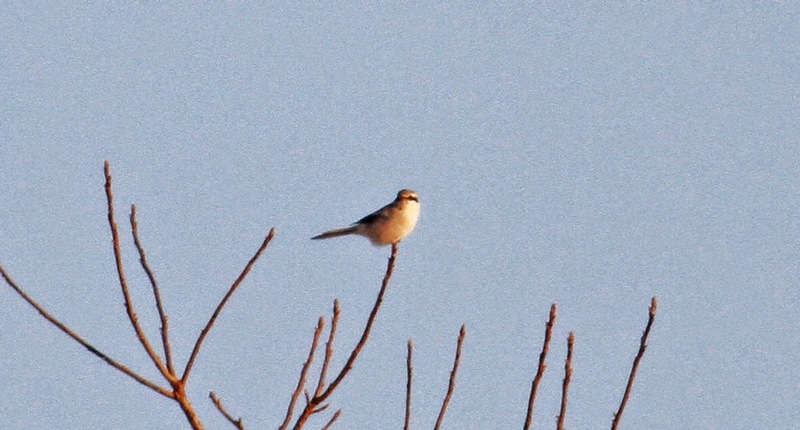 Northern Shrike - Arcadia Meadows, Northampton, Hampshire Co., MA. January 14th, 2015. 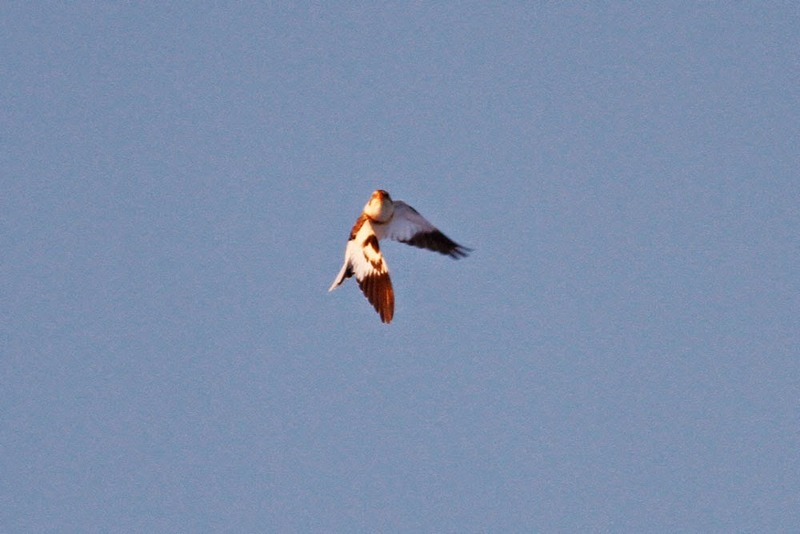 Snow Bunting - Arcadia Meadows, Northampton, Hampshire Co., MA. January 14th, 2015. 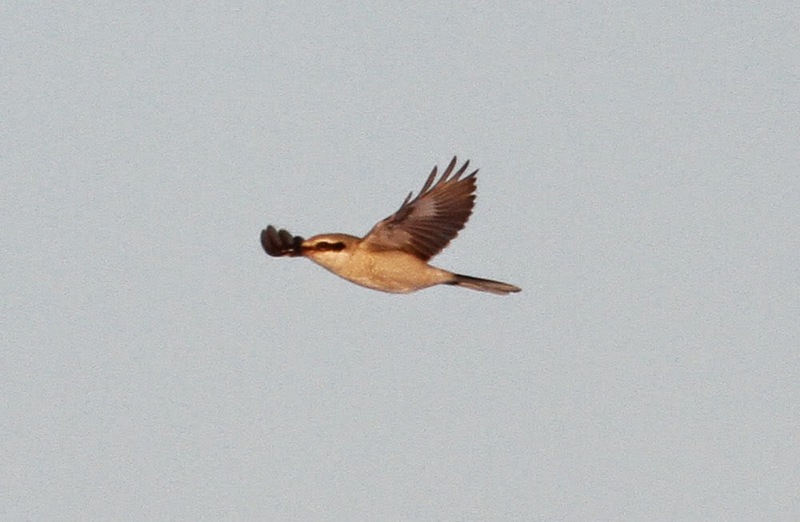 One of about 20 being persued by the Northern Shrike above. The gull show at Turner's Falls has been very hit n' miss since Christmas. 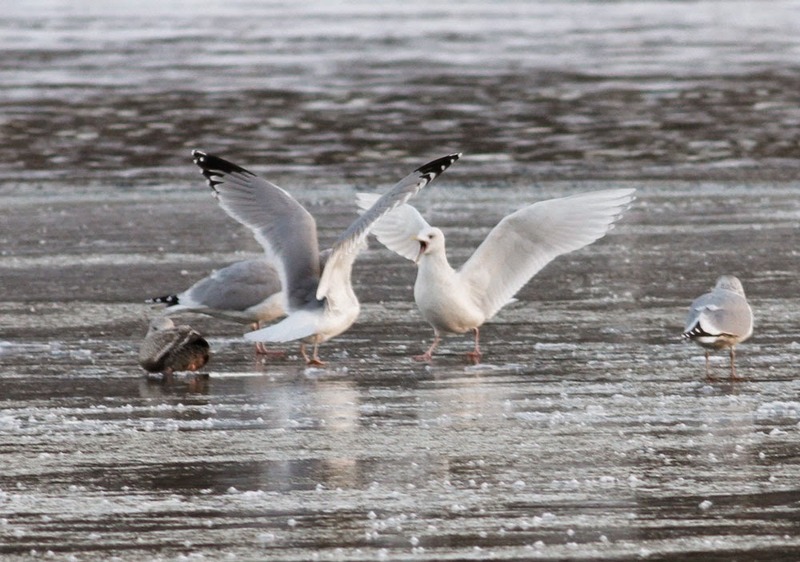 Yesterday, for example, I could only find one Herring Gull on the ice at Unity Park. 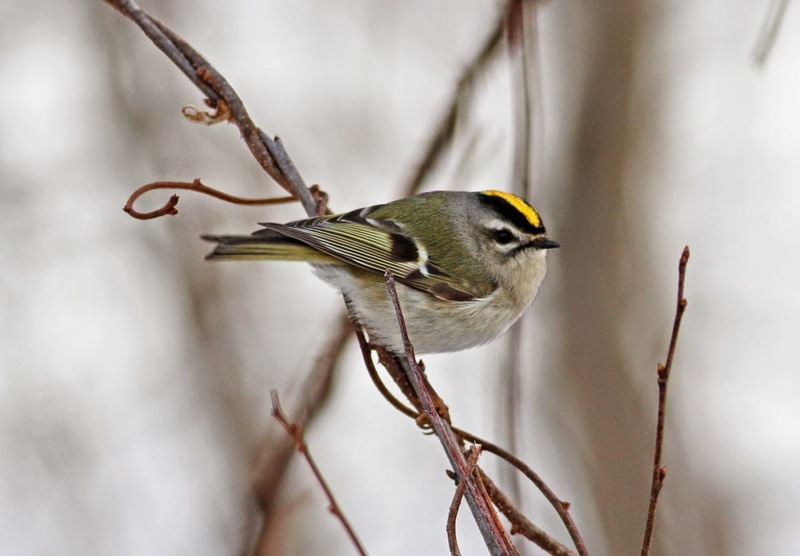 This evening, however, small roosts developed at Unity Park and on the ice at the power canal. 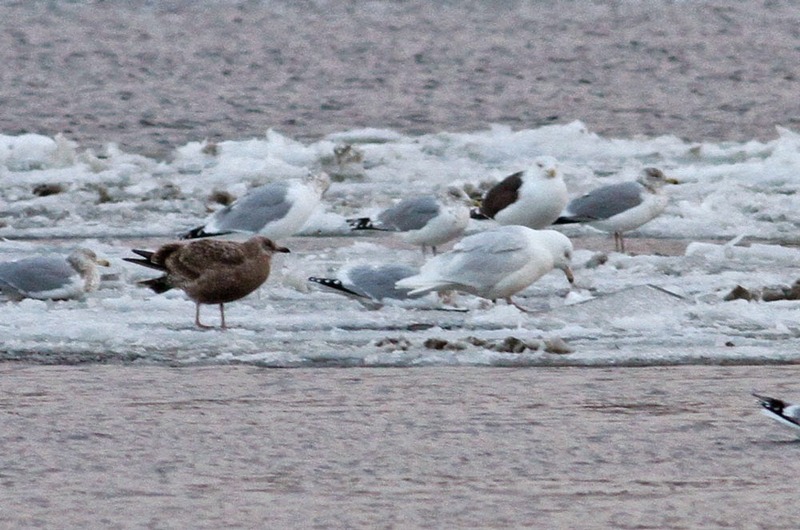 The group on the power canal attracted a smart third-cycle Glaucous Gull, my first of the winter. Other than that, another great build up of diving ducks at dusk with some 100 Common Mergansers and 65+ Common Goldeneye. 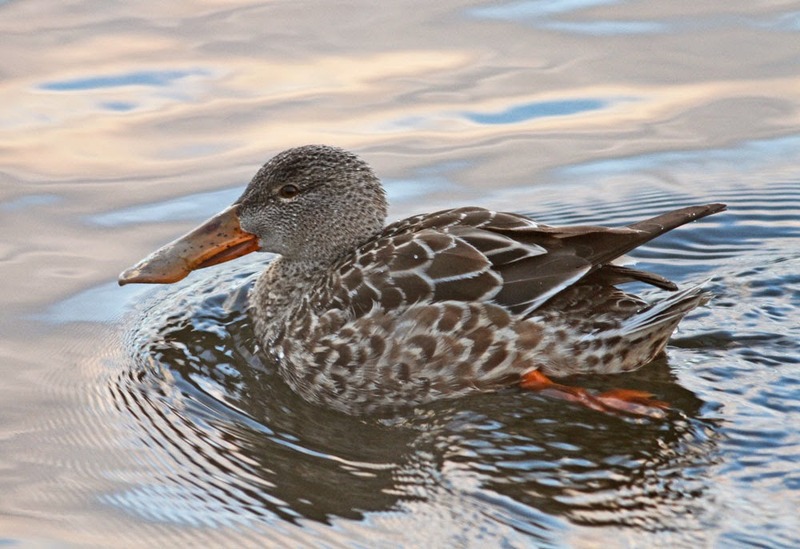 The female Northern Shoveler continues to show well with a handful of Mallards. Glaucous Gull - third-cycle, Turner's Falls power canal, Franklin Co., MA. January 9th, 2014. 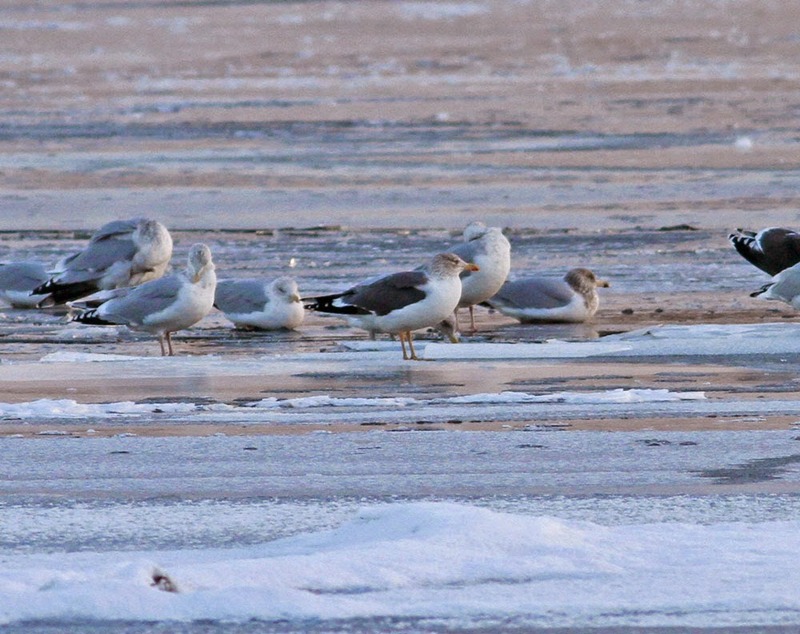 With American Herring and Great Black-backed Gulls. Northern Shoveler - female, Turner's Falls power canal, Franklin Co., MA. January 9th, 2014. At home in Northfield, lots of activity on the feeders including a White-throated Sparrow whilst a Hermit Thrush was feeing on berries in the front yard early this morning. More frigid weather in the forecast for tomorrow, apparently. A two hour delay at school gave Matan and I chance to run errands and still have enough time to check the state of the ice at the power canal. 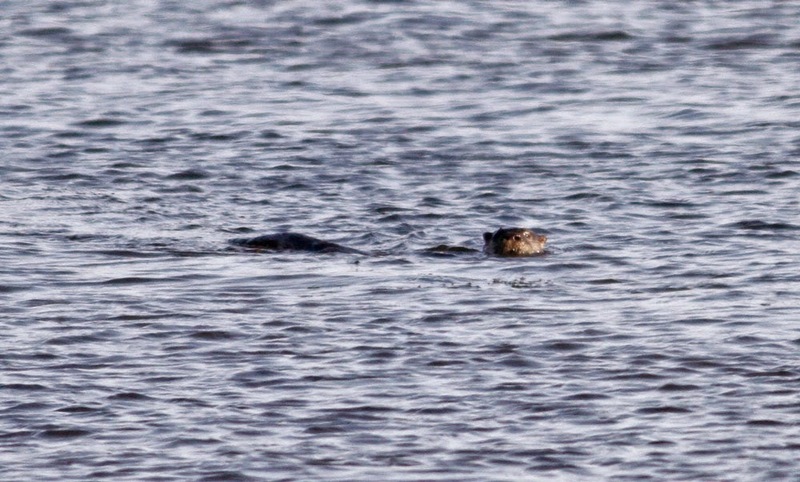 A dark brown blob on the ice didn't register at first and I was far more interested in the 400 dabbling ducks flying around that had just been flushed by a Bald Eagle.....but that blob started to move and casually slinked into the water - Otter! 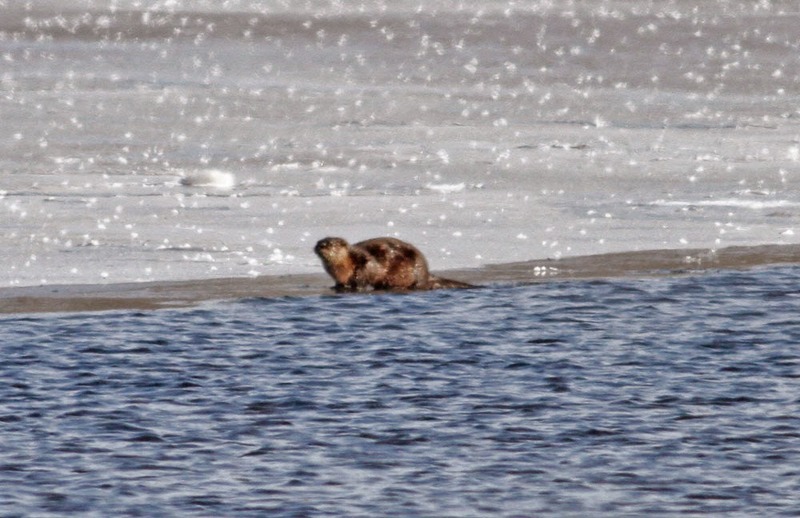 It was submerged for what seemed like forever (it was about 0 deg F outside) but then shuffled back onto the ice giving Matan his first River Otter in the wild. 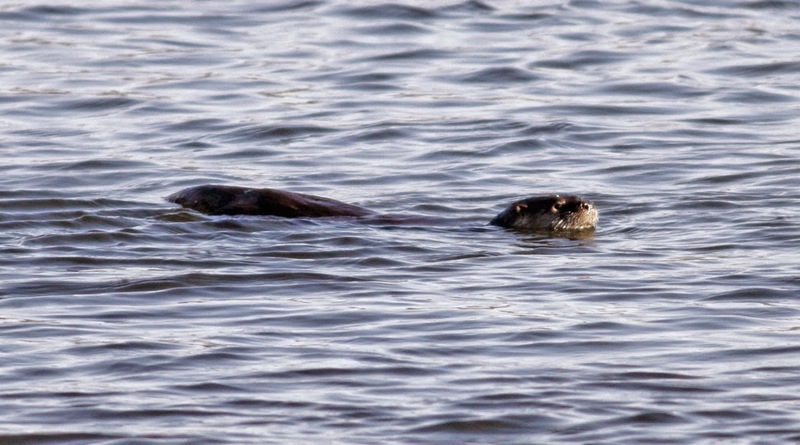 Even better, it swam over to check us out..........it's Matan's favorite mammal and his face says it all! 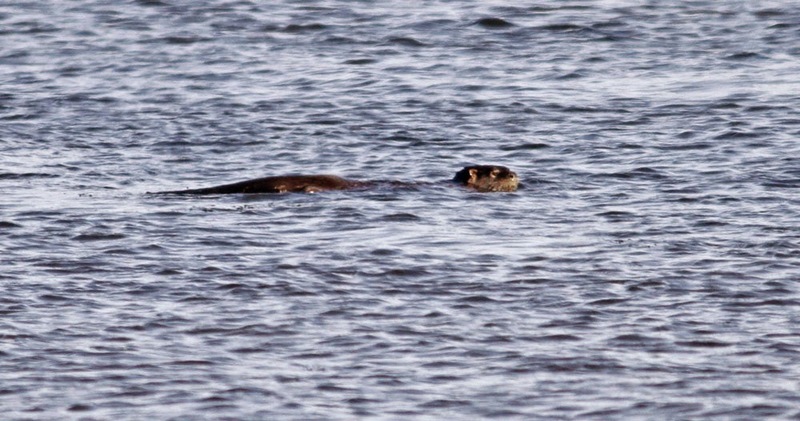 American River Otter - Turner's Falls power canal, Franklin Co., MA. January 8th, 2015. 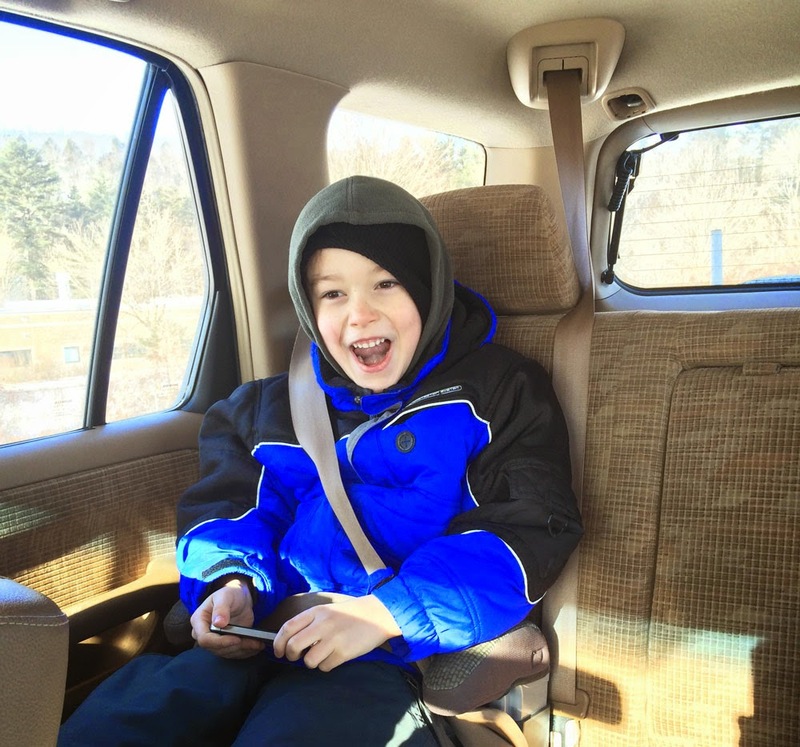 So the frigid air has arrived. It was a balmy 7 deg F (- 14 deg C) at dawn in Gill this morning. This didn't seem to be any hardship for the Northern Shrike on Boyle Road which was teed up high as I drove Matan into school. 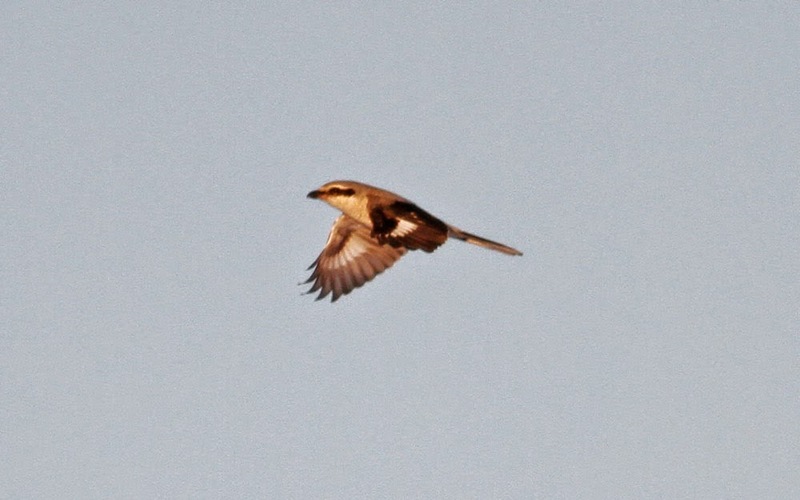 It was the first time I'd seen the shrike since Christmas despite frequent checks. 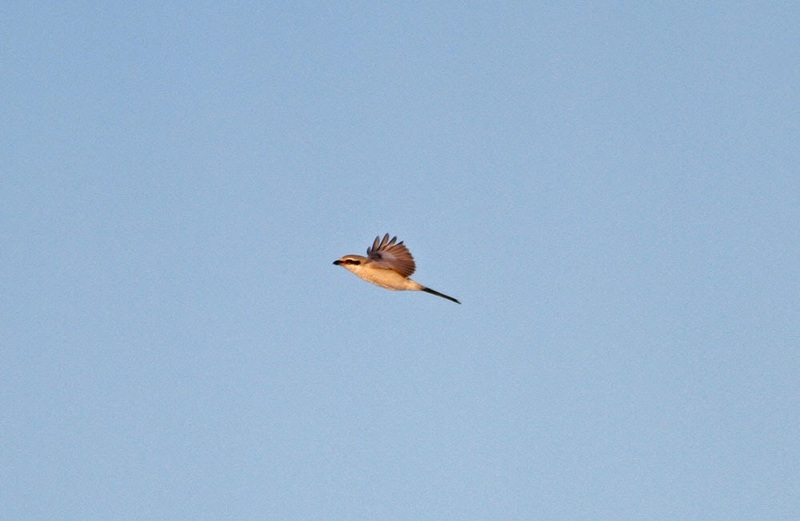 Northern Shrike - Boyle Road, Gill, Franklin Co., MA. January 7th, 2015. 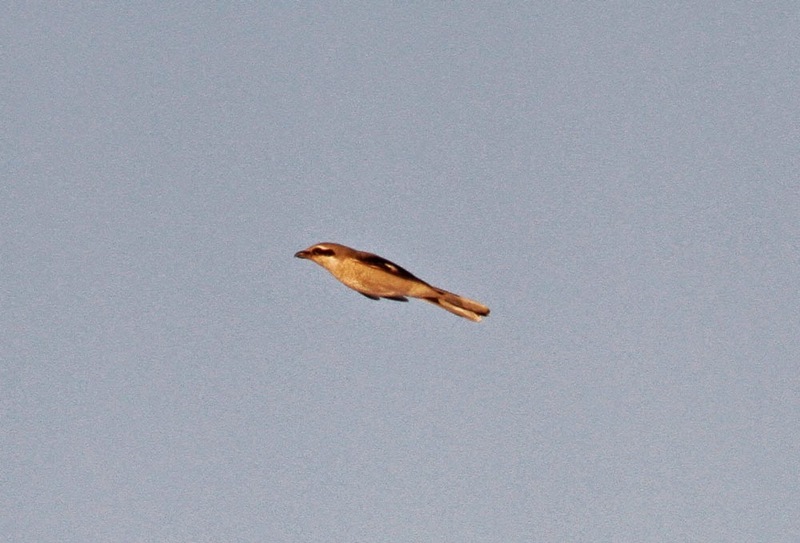 Hideous record shot, heavily cropped and possibility not even identifiable.....but it's still a shrike. 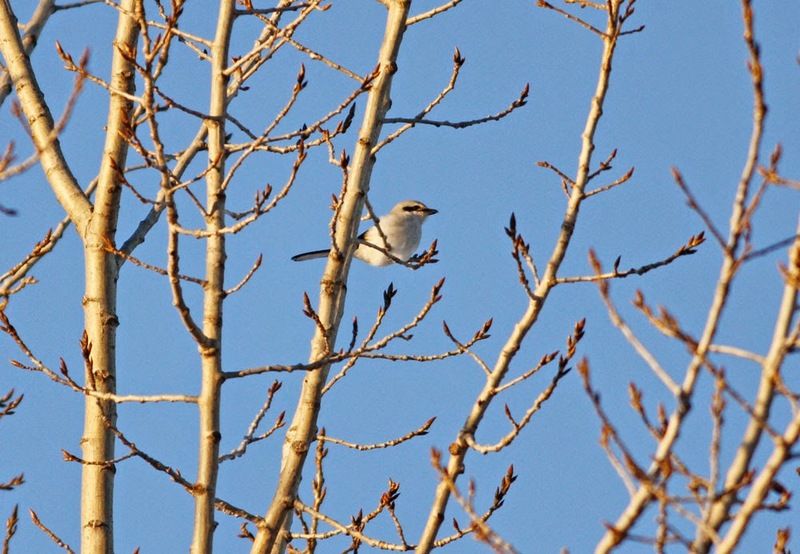 Northern Shrike - Boyle Road, Gill, Franklin Co., MA. January 8th, 2015. 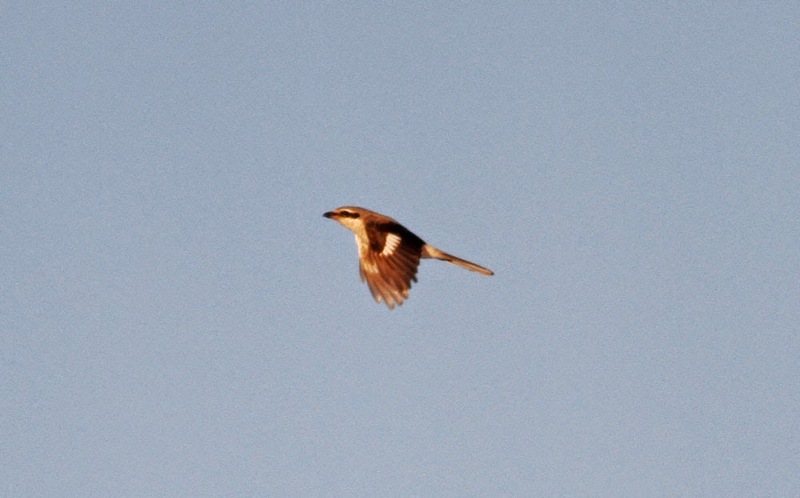 Same bird as above but a bit closer to the road in late afternoon sunshine. Yesterday afternoon the freeze was really starting to kick in. 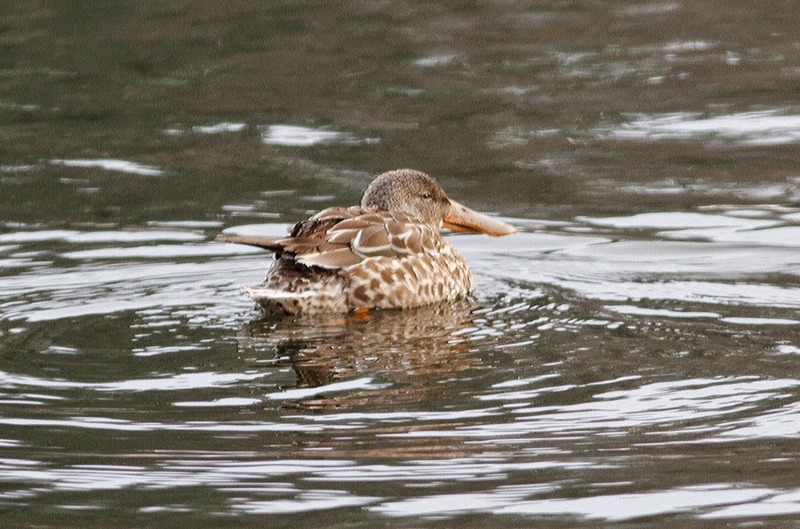 Again I saw the Northern Shoveler at the power canal in Turner's Falls, this time with Mallards. 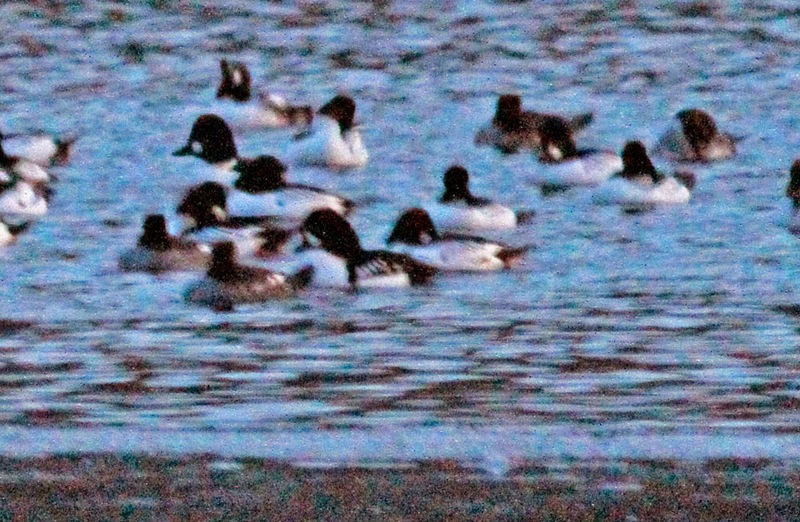 There was also a fabulous roost of diving ducks with over 150 Common Goldeneye, 9 Hooded and 65 Common Mergansers. 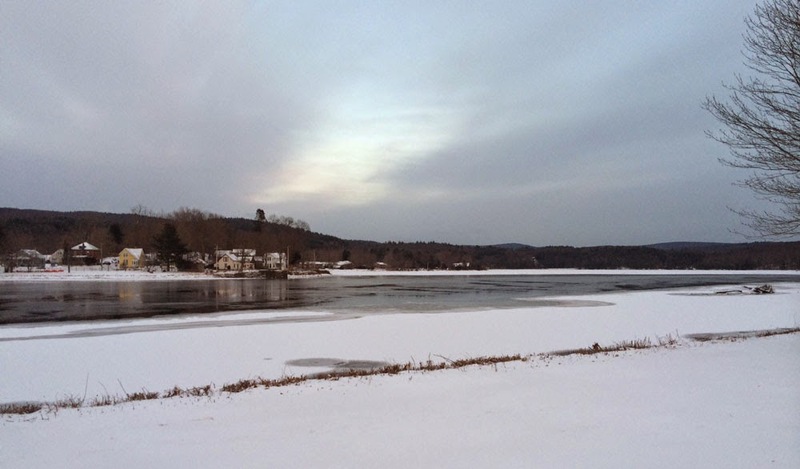 Barton Cove - from Unity Park, Turner's Falls, Franklin Co., MA. January 6th, 2015. Well on the way to being completely frozen. Northern Shoveler - female, Turner's Falls power canal, Franklin Co., MA. January 6th, 2015. Common Goldeneyes and Common Mergansers - Turner's Falls power canal, Franklin Co., MA. January 6th, 2015. A small part of the impressive roost but no sign of the Barrow's Goldeneye, alas.